The Renaissance Center, left, GM's global headquarters, rises above Detroit, which became the biggest U.S. city to file for bankruptcy on Thursday. The Detroit 3 voiced support for the city after it sought court protection from creditors to eliminate a budget deficit and cut long-term debt. DETROIT -- Detroit, cradle of the U.S. auto industry, became the most populous American city to file for bankruptcy, seeking court protection from creditors while it tries to eliminate a budget deficit and cut long-term debt. "I authorize this necessary step as a last resort to return this great city to financial and civic health for its residents and taxpayers," Michigan Governor Rick Snyder, a Republican, said in a letter Thursday authorizing Kevyn Orr, the city's emergency manager, to file the petition. Michigan's largest city has seen its population decline to 707,000, down 7 percent since 2010, according to U.S. Census data. Median household income was less than $28,000, compared with $49,000 statewide, and more than 36 percent of residents lived in poverty as of 2011, Census data show. The median home value of $71,000 was barely half the $137,000 value statewide. The city listed assets and debt of more than $1 billion in a Chapter 9 petition filed today in court in Detroit. Chapter 9 of the U.S. Bankruptcy Code is reserved for municipalities and differs from the rules used by bankrupt companies in Chapter 11. Orr warned in May that the city might run out of cash. His proposal to restructure more than $17 billion in debt and long-term obligations includes cutting pension payments for public employees, ending cost-of-living increases, removing some workers from the system and making the rest pay more. "Without a significant restructuring of its debt, the city will be unable to break the cycle of damaging cutbacks in essential municipal services and investments," Orr said in a report. William Nowling, spokesman for Orr, didn't immediately respond to requests for comment on the filing. A state court judge today temporarily barred Snyder and Orr from taking any action that would allow cuts in pension benefits for city retirees, while allowing the bankruptcy to proceed. The pension funds sued Wednesday to stop the filing. Detroit joins Jefferson County, Ala., and the California cities of San Bernardino and Stockton in bankruptcy. The move was inevitable, said Steven Rattner, a New York financier who headed President Barack Obama's auto-industry task force in 2009 that put the predecessors of General Motors and Chrysler Group into bankruptcy reorganizations. "It's analogous to the auto companies, in that you have too many stakeholders whose claims are too underwater to have realistically ever worked this out without some kind of bankruptcy," Rattner said in an interview. "I felt the same way about the auto companies as I did about Detroit from the first moment -- bankruptcy was the only option. Unfortunately, I think it was always inevitable." GM and Chrysler each emerged from Chapter 11 reorganizations in about six weeks and have since developed popular new models and returned to profitability. Detroit won't be as easy to fix, Rattner said. "This will be much messier than the auto companies," he said. "This will go on for a long time." "You're going to have much bigger haircuts for the workers and that's going to mean much more pain than the workers for the auto companies were asked to bear," Rattner said. Years of job losses at U.S. automakers intensified a decline that began in the 1950s, when white homeowners began moving to the suburbs, Scott Martelle, author of "Detroit: A Biography," said in an e-mail before the filing. "As the tax base eroded, basic city services eroded, too," he said. 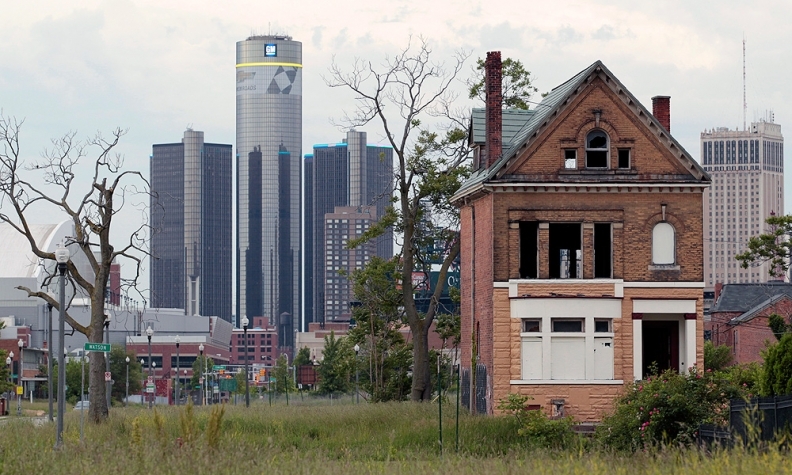 Detroit today "is too big geographically -- 140 square miles -- for its dwindling and impoverished tax base to support." Detroit was once synonymous with U.S. manufacturing prowess. Its automotive giants switched production to planes, tanks and munitions during World War Two, earning the city the nickname of "Arsenal of Democracy." GM, which has emerged from bankruptcy a healthier company with less debt and fewer brands, said it is hopeful Detroit can rebuild itself into a stronger city. The company, in a statement after the city's filing, said it does not expect the city's bankruptcy to impact its operations or business outlook. "GM is proud to call Detroit home and today's bankruptcy declaration is a day that we and others hoped would not come," the automaker said. "We believe, however, that today also can mark a clean start for the city." GM employs nearly 3,000 people in the city, mostly at its headquarters in the Renaissance Center downtown. It also has more than 1,000 employees at its Detroit-Hamtramck assembly plant, which borders both Detroit and Hamtramck. Chrysler employs more than 5,800 workers in the city. The bulk of the company's Detroit work force staffs the company's Jefferson North assembly plant, home of the Jeep Grand Cherokee and Dodge Durango SUVs, on the city's east side. Chrysler also employs about 75 employees at Chrysler House in downtown Detroit. "We not only continue to invest in the city and its residents by adding to our presence in Detroit, we also are committed to playing a positive role in its revitalization," Chrysler said in a statement. Ford Motor Co., based in nearby Dearborn, Mich., said it hopes Detroit's bankruptcy will help reinvent the community. "The city has a difficult job ahead, and we are optimistic that governmental leaders will be successful in strengthening the community," Ford said in a statement. In February, a state report concluded the city was in the midst of a fiscal crisis, a finding required under Michigan law before the city could be eligible to seek court protection from creditors. Chapter 9 will give Detroit an advantage over companies using Chapter 11 to reorganize. Unlike companies, municipalities don't need to ask the bankruptcy court for permission to pay any bills they ran up before filing for court protection, including wages, utility bills and rents. That means creditors can't put as much pressure on a city over its spending habits, as sometimes happens in Chapter 11 cases. Chapter 9 creditors also can't offer their own reorganization plan and aren't entitled to form an official committee with legal fees paid by the municipality. Unsecured creditors typically have those rights under Chapter 11, which is used by companies to try to stay in business and reorganize. Among the biggest drains on the city's general fund, which pays for police, fire and other basic services, are health benefits paid to 18,500 retired city workers, mostly former police and firefighters, according to Orr's May report. Without changes, the city will pay $163 million for retiree health-care costs in the next fiscal year, which starts July 1, the report found. The city has been operating under a financial stability agreement with the state. With the state's help, the city issued $130 million in new bonds, part of which was used to pay off short-term debt. To get access to the remaining proceeds, the city was forced to hire a restructuring firm and, in December, the law firm of Miller Canfield Paddock & Stone Plc to help formulate a recovery plan. Detroit ran short of cash last year and was forced to borrow $92.2 million from other funds, including its solid waste, street and risk management funds. At the end of June, the city also owed its retirement funds $60.5 million, according to the audit. Detroit's bond ratings were cut deeper into non-investment grade last year by Moody's Investors Service, which cited the possibility of bankruptcy or default within two years. David Phillips of Automotive News, Bloomberg and Reuters contributed to this report.